So many things are happening! Well not really. But some are. Anyhow my final shot at iAnimate for a while is nearly done! I've been tweaking and sitting through a depressingly long render time, but it's almost complete. In the mean time, here's a turtle walk I did to keep me animating while I enjoy summer, preparing for Sheridan and general laziness. The character was designed by Boris Maras, a Sheridan grad. Although I forget who modelled and rigged it, either way it's beyond appealing. So, I had my orientation/program tour of Sheridans Animation program over the weekend. It definitely got me excited for next year. The people are great, the teachers seem great, and holy crap can people draw there. I am very confident in my skills as an animator, I have so much to learn, but I also know that I know what I'm doing. I think. Anyhow, I'm certain I'll at the very least be one of the more advanced first year animators. However, I'm surely going to be swallowed in an ocean of brilliant draftsmen. The animation wing walls are lined with art, and it's pretty damned intimidating. I think I can hold my own in animation, but how I'll compete when it comes to pure drawing baffles me. I think I'm in for a very humbling experience. 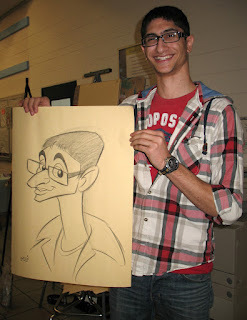 Also, I was lucky enough to get a Pete Emslie caricature!!! 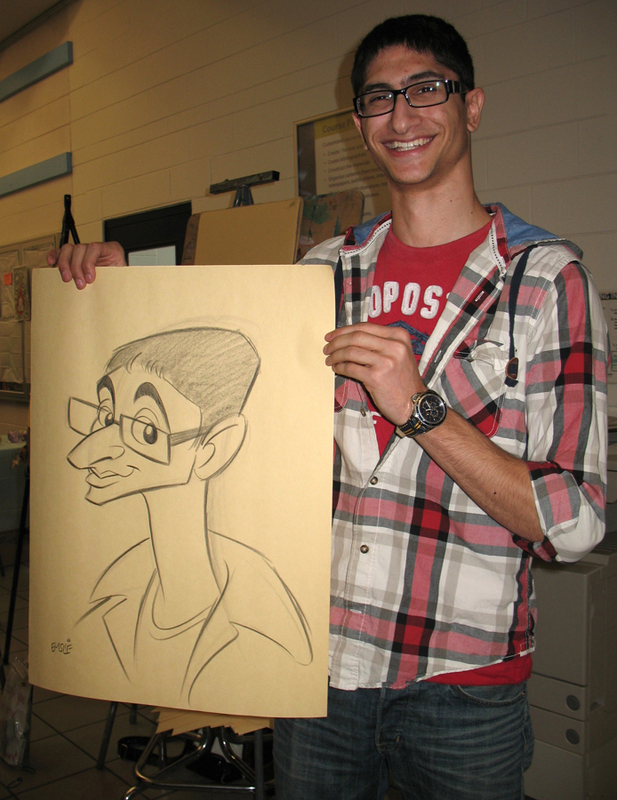 He's a second year character design teacher at Sheridan, and man can he draw. I found out about him a few years back, and ever since I saw his caricatures I've been yearning for one of my own. I can very happily say that I finally got one! Check out that nose! You could land a plane on it, poke an eye out with it, and many other hilarious nose jokes as well, I imagine.